The mile-high ceilings and starch-white walls paint the perfect contrast to the portraits hung on the wall. Splashes of color. Straight lines, tossed around on the paper. Oblong faces stretched for the onlooker’s gaze. Four pieces, each distinct in appearance, each frame a human body, posing and looking out at the studio. In front of the far right piece is a man with a colorful Jaxon hat on, struggling to proportionally align the portrait’s eyes with the rest of the face. This man is none other than the creator of these lively, meaningful pieces, Kris Hargis. When we sat down to an interview about his creations, Kris began to tell me about his artistic past and how he got to be where he is now. He has been studying and practicing his artistic abilities since he was an adolescent, focusing primarily on the self-portrait, like the one he was working on when I arrived. In order to widen his artistic horizons, Kris attended the University of Kansas for his undergraduate degree, and then went to Boise State University for his master’s. While at BSU, Kris was encouraged to step outside of the self-portrait, and he learned how to make bronze busts of his own head. For Kris, trying to connect to other humans was his specialization in art, and trying to form this relationship through a two-dimensional plane wasn’t enough. So, the three-dimensional human sculpture, like a bronze bust, became a way for him to explore this human connection. While at BSU, Kris also became a studio assistant at Penland School of Craft, and he participated in Michael Dixon’s painting process and performance workshop. At the time, Dixon was a professor at Albion (and is now the department chair for the Art & Art History program at Albion). He suggested that Hargis apply to the artist residency program at Albion College. Hargis found out in April of 2016 that he was accepted and was ecstatic to be able to focus on his artistic work for three months. Since January, Hargis has been at Albion, braving the blustery Michigan winter, while he works on his creative pieces. While here, he has been able to create four self-portraits. Four pieces of art are more than he is usually able to put out in a short amount of time, considering each of his pieces is a tedious process. He looks into the mirror for hours, drawing what he sees in his reflection on a paper without looking at it. Then, there is a lot of subtractive mark making, where bits of the piece that aren’t correct to his final image of the piece are removed. As he adds in more and more and tweaks different aspects, the piece slowly comes together. Finally, he throws in color to the final image, all with a specific palette that he hopes evokes some feeling to both him and the onlooker. After a few days or weeks of working and everything is set how it is supposed to, highlights to the self-portrait are made, and the piece is seemingly completed. However, Hargis believes the piece of art isn’t truly finished until there is this human-to-human connection between himself and the onlooker that was evoked from the piece. “If you think of two squares of pavement and that little area in between, there’s some grass growing. That’s the interstice, the area in between. There’s me and then you, and the interstice is the us,” said Hargis, illustrating the connection between himself and the viewer. 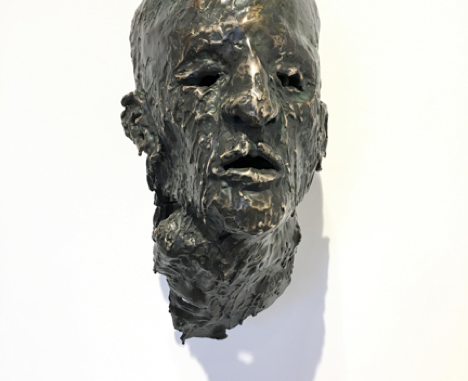 Therefore, the interstice between Hargis’ art and the observer looking at the portrait is the emotion that is evoked from the portrait and is shared between Hargis and the observer, creating this human-to-human connection. This emotion is the grass between the two squares of pavement, which will create discussion between Hargis and the observer. “My goal is that the viewer can come stand in front of these pieces, come into them with an open mind and an open heart and possibly receive a message, relate to that gaze or emotional qualities that the color palette gives, kind of inviting the viewer to become a part of the piece and finish it in a way,” said Hargis. His creations from his time at Albion will be presented in a gallery showing called “Interstice” from February 24 through March 29 in the Munro Gallery at the Bobbitt Fine Arts Building. Hargis’s hope for this show is to engage the onlooker with the piece and to find some human-to-human bond over his self-portrait. Kris is available for any questions, comments, critiques or conversations in his studio at the Fine Arts Building anytime Monday through Thursday, 2:30 to 4:30 p.m. Or you can contact him via email at krishargis@gmail.com. More of his work can be found at www.kristianhargis.com or www.froelickgallery.com. Photo courtesy of Kris Hargis. “If you think of two squares of pavement and that little area in between, there’s some grass growing. That’s the interstice, the area in between. There’s me, and then you, and the other, and the interstice is the us,” said Hargis, illustrating the connection between himself and the viewer. The part that I highlighted in bold – can this be removed? When we talked I mentioned there is me and you and the interstice. I know I mentioned me and others, but I do not want people to associate the condition and quality of Otherness. Thank you so much for addressing this if possible.